Mike Shanahan has a 24-39 record in four seasons with the Redskins. 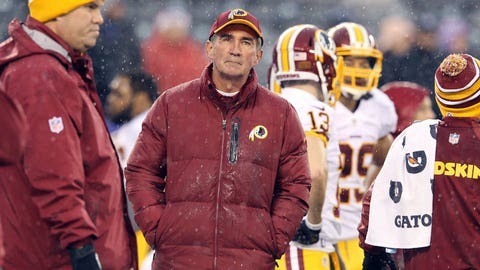 Mike Shanahan’s future with the Redskins is expected to come to a close, FOX Sports 1 NFL insider Jay Glazer reported Sunday morning. Shanahan could be fired as soon as Sunday night or Monday, but his termination will “definitely” come, The Washington Post reports, citing sources who have knowledge of the matter. As Black Monday hovers over the NFL world, speculation has arisen that the Redskins head coach could be the first domino to fall. Shanahan, who was hired in 2010 as the team’s head coach and vice president of football operations, has a record of 24-39 over the past four seasons. Shanahan led the Redskins into the postseason last year for the first time since 2007. Speculation over Shanahan’s future in Washington coming to an end began when an ESPN report detailed a fracture in the relationship between himself and team owner and Dan Snyder. Since then, Shanahan has benched quarterback Robert Griffin III, dodged questions about his future and has staged some very memorable news conferences. If Shanahan is fired, the Redskins would still be on the hook for $7 million, as his contract runs through next season.